The key to good organising, planning and controlling in global marketing is to create a flexible structure or framework which enables organisations to respond to relevant differences in the markets in which they operate, but, at the same time, delineates relationships clearly between parts and personnel of the company. There are no prescriptive solutions to the questions of what is the most appropriate organisational structure, planning framework and form of agricultural control. One thing is clear though -organisations can only work effectively if structure is defined, standards of performance are designed and communicated, and the control framework is fair, clear to all and agreeable. This is not to say that once the structure is defined, it cannot be changed. In fact, modern marketing thought is that formal structure is just not the order of the day. Many informal structures develop within formal frameworks. Many organisations make the mistake of setting a structure first, long before they have decided on a strategy. This is a recipe for disaster as it forces organisations to fit the strategy to the structure, with all the inherent dangers of such rigidity. · To briefly describe the different methods of control in global marketing and the variables which can affect the control mechanism. The chapter starts with an examination of the evolution of global organisational development and then briefly describes some of the different types of organisational form and their advantages and disadvantages. The next section considers why planning is necessary in global marketing and reviews standardised, decentralised and interactive planning types. The chapter ends with an overview of the different types of control methods and a case study which serves as an example of global marketing control. The chapter does not consider the detail of control in global operations, this being left to any standard marketing text. As stated earlier, in most developing countries international marketing organisation is relatively rudimentary, so the forms of organisation will be only briefly covered here. As constantly stated in this text, production and marketing systems, whether they be food commodities, inputs or whatever, are interdependent. As such the activities and economic entities within the network of exchange relationships and any other coordinating mechanisms are complex. Because of this, analysts usually look at the activities of organisation, coordination and performance evaluation within a subsystem or single commodity. But this approach has drawbacks because the distinctions between traditional commodity systems are breaking down. Take for example the manufacturer of ready -to -eat meals. Not only does the manufacturer draw from meat, vegetables and many other raw material suppliers but substitute technologies may begin to "stray" into the traditional raw material supply system, for example, artificial flavourings. Most agricultural products and commodity systems exhibit widely different organisational characteristics between countries. Different governments have different programmes, horizontal and vertical structural elements can vary, as can terms of access, competitive conditions, parallel marketing channels and the types of contractual and ownership integration. Coordination in international marketing is complex and vital. For Israeli fresh produce to arrive on a UK's family table within 48 hours or less is quite remarkable, but a complex operation. Vertical coordination, harmonising all the vested production, marketing, exchange interfaces and value added stages is a challenge. In order to make the process flow smoothly, information is vital as well as an understanding of all definitions and permissible behaviours of the participants. Most failures to vertically coordinate will probably reveal themselves in resource misallocations, technical inefficiencies and other risks. An over-supply of tomatoes, for example, may incur storage costs or waste. One good example of an almost perfectly coordinated system is that of Geest bananas. Not only do the bananas ripen on the voyage over to the UK from the West Indies, but they are specially treated so that they ripen at the exact time when required. In evaluating agricultural performance a large number of indicators and norms are utilised. 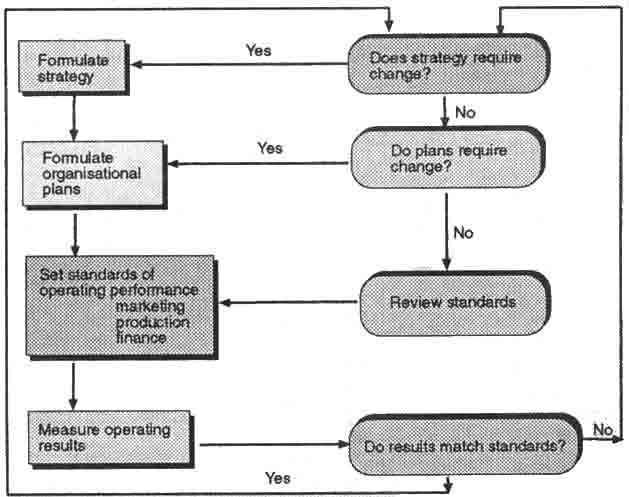 This-so called "structure, conduct and performance" paradigm is well documented (see Helmberger et al 1981)1. Most work has centered around operational and allocative efficiencies as well as longer term development patterns and the environmental and the economic impact of commodity systems. But the analysis cannot stop there, as agricultural marketing involves marketing, so the quality of marketing sources should also be assessed, and put into quantitative forms. Transaction costs should also be included. These primarily relate to costs associated with buying, selling and transferring ownership of goods and services, and are very wide ranging. These costs include information, negotiating contracts, the actual costs of transferring goods, services, money and ownership rights, costs of monitoring trade conditions and enforcing trading terms and conditions. Transaction costs tend to get less attention than other costs. Table 1 gives a summary of performance criteria useful in agricultural marketing. 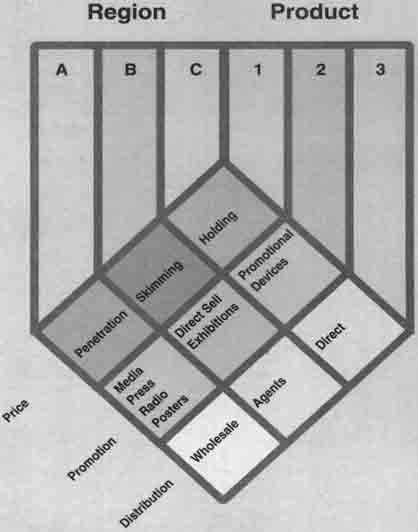 The form of appropriate organisation depends on a number of factors including company goals, size of business, the number of markets operated in, the level of involvement in the market, international experience, the nature of the product, the width and range of the product line, the nature of the marketing task and the risk involved. Many organisational forms in developing countries are relatively unsophisticated. Many are "domestic" based, that is, they may have a small export division within the domestic based operation. Most organisations deal through agents or other merchanting houses which have their own organisation. Flowers and vegetables, exported from Eastern and Southern Africa, are generally sold through agents, auction systems or distributors in the country of destination. Because of this relative lack of sophistication this chapter will concentrate only briefly on the various forms of organisation. Depending on the factors described above organisational development usually starts with dependence on outsiders, for example horticultural produce is usually handled by overseas agents who have their own exporting organisation or by a local network of services like cool store owners, freight forwarders and so on. As the organisation grows it usually has an overseas subsidiary which reports to it. This is exemplified by Oserian and Sulmac flowers of Kenya, who in turn are part of multinationals. 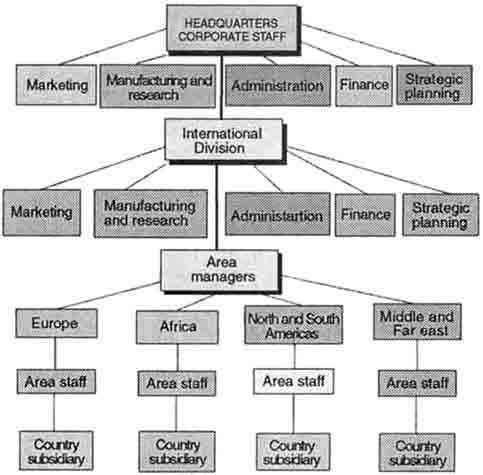 Eventually, the organisation grows in complexity and extent of operations, which then gives rise to an International Division structure, with its own personnel. The next stage of evolution is the development of regional headquarters or regional management centres. Differences between regions are a pressure to create the regional centres. Regional centres can be costly, so they must be developed with care. Levels of raw materials, commodity wastage. As the organisation continues to evolve, the international division may be replaced by a variety of structures like a geographical, product, function or strategic business unit approach. The area organisational form is used by highly orientated organisations with stable products. See figure 13.1. The advantages and disadvantages of this form are as follows. A second organisational form is the product organissation structure. These product groups have global marketing responsibility 2 See figure 13.2. A third organisational form is the functional organisational structure. Here executives on functional areas have global responsibility. See figure 13.3. - may miss market opportunities because of narrow focus. SBUs are defined as a group of products or technologies that serve an identified market and compete with identified competitors. In many ways an SBU is not part of a formal structure but represents a process or system overlay for the purpose of developing a business strategy. The final organisational form is that called a Matrix organisational structure. See figure 13.4. Matrix organisations are the most sophisticated form of organisation and bring together four competencies -geographic knowledge, product knowledge and know-how, functional competence in such fields as finance, production and marketing, and a knowledge of the customer (figure 13.4) industry and its needs. Management's task in a matrix organisation is to bring together all the above perspectives and skills to achieve particular objective(s). Matrix structures require a fundamental change in management behaviour, organisational culture and technical systems. One of the important things to remember is that structure must always follow strategy. Too often structures are developed long before a strategy is worked out. This can cause "straitjacketing" and lead to an inflexibility which is both unnecessary and stifling. It is likely to be quite a while before less developed countries have developed a number of the organisational forms described above. The important thing is to keep an arrangement which allows the company to grow, control and manage its destiny. a) Situation analysis - where are we now? b) Objectives - where do we want to be? c) Strategy and tactics - how can we best reach our goals? · Helps in a continuous review of operations. The planning task depends on the level of involvement in a country. Exporting and licensing give minimum country involvement but joint ventures involve more in-country activity and give a greater degree of integration and control. Wholly owned subsidiaries give the organisation almost total control. Because of the "external uncontrollables" international planning is rather more difficult than domestic planning (see table 13.2). Planning can be standardised, decentralised or interactive. - Cost savings on limited product range and economies of scale both in production and marketing, for example fertilisers. - Uniformity of consumer choice across the world. - Different market characteristics make uniform products inappropriate, for example, fresh milk products. Environmental obstacles disallow standardisation; for example lack of refrigerated transport in developing countries. Decentralised plans take into account the subtleties of local conditions; however they are usually very costly and resource consuming. In this approach headquarters devises branch policy and a strategic framework, and subsidiaries interpret these under local conditions, for example Nestlè. Headquarters coordinates and rationalises advertising, pricing and distribution. Within any of the above approaches plans can be either long or short term. Increasingly planning is becoming fairly routine. Most companies operate "annual operating plans" although these are often "rolled forward" to cover a few years hence. c) Knowledge of the marketing functions. In many cases LDCs have found it difficult to make real international inroads often because they lack the information required. "Country grouping" is an effective way to plan. Hence countries are grouped according to a number of criteria and treated alike. Such criteria include market size, market accessibility (market or commercial economies), stage of market development, prospects for growth, and promise for future growth and development. Zimbabwe may be a "promising" country for investment, but Somalia may not be "promising". Other concepts for planning are "competence centres". The mission of a competence centre is to formulate a global business strategy for a new business. Competence centres are not those developed through "leadership" ability but involve a number of factors like strategic location and skills. In marketing planning, ultimately, the decision on the type of plan rests entirely on the size of the task, type of task and competence to achieve the task. In exporting flowers, say, to Europe, Zimbabwe would be well advised, with the small quantities involved, to leave the task to those experts in Holland and Germany whose knowledge and competence is far superior. The downside is that some market opportunities may be overlooked. Factors like distance, culture, language and practices create barriers to effective control. Yet without control over international operations, the degree to which they have or have not been successful cannot be judged. Plans are the prerequisite to control, yet these are developed in the midst of uncertain forces both internal and external to the firm. Basically control involves the establishment of standards of performance, measuring performance against standards and correcting deviations from standards and plans. In international marketing the ability to control is disturbed by the distance, culture, political and other factors. Figure 13.5 illustrates a typical plan/control cycle. 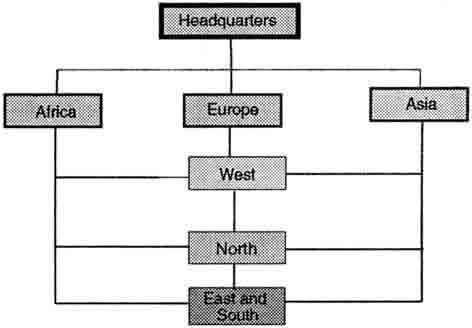 In well developed international operations headquarters may seek to achieve control over subsidiaries by three types of mechanism - data management mechanisms, merge mechanisms, which shift emphasis from subsidiary to global performance, and conflict resolution mechanisms that resolve conflicts triggered by necessary trade-offs. The method of export control in many less developed countries takes the form of direct organisation by government. The appendix note at the end of this section describes the types of control imposed. Planning and budgeting are the main formal control methods. The budget spells out the objectives and necessary expenditures to achieve these objectives. Control consists of measuring actual sales against expenditures. If there is tolerable variance then no action is usually taken. Performance is evaluated by measuring actual against planned performance. The problem is setting a performance standard. Usually it is based on historical performance with some kind of industry average. Problems of international comparison inevitably occur like how does one plan in an environment where exchange rates fluctuate quite often during the budget period. a) Market potential - how large, can it be tested? b) Competition - what is the competitive level? d) Process - headquarters may impose an "indicative planning" method or guidance. Other measures of performance include share of market, image, position or corporate acceptance. Often these are difficult to obtain where data or data collection is difficult. When staff are transferred from market to market, they often take their standards of performance with them and these can be assessed. Other methods include face-to-face contact and evaluation. h) Size of international operators - the bigger and greater the specialisation of headquarters staff the more likely will extensive control be applied. Obviously the ability to control any international operation, whether it be very sophisticated or relatively unsophisticated, the process will break down without adequate face-to-face and/or electronic communications. The foreign trade of many developing countries is subject to various controls. The instruments of control and the Intensity of application of these Instruments vary from country to country, depending on what happens to be the principal reason for their Institution. Licensing Is probably the most prevalent instrument of import/export control in developing countries. For reasons of self interest, import licensing is generally more pervasive than export licensing. To a considerable extent, tariffs and procedures and documentation on imports and exports also do play a controlling role. This brief note concentrates on export licensing in Malawi, the coverage of the licensing and the reasons for its existence. In this country the main legal instrument for the licensing of both export and import trade is the Control of Goods Act (Chapter 18:08 of the Laws of Malawi) and the subsidiary regulations made thereunder. The administration of the Act falls primarily under the jurisdiction of the Ministry of Trade and Industry. However, occasionally and on specific products, the Ministry consults with other Institutions, like the Agricultural Development and Marketing Corporation (ADMARC) and the Ministry Of Agriculture when considering applications for export licences. Furthermore, In the case of tobacco exports, the control is relegated principally to the Tobacco Control Commission. Similarly, the administrative and day-to-day regulation of exports of bulk tea and coffee is largely done by the Trade Associations of those product groups - the Tea Association of Malawi and the Coffee Association of Malawi. The products covered in export licensing are fewer than those which are subject to import licensing. Of the products which are listed as licensable under the Control of Goods Act, the commonest are the traditional agricultural export commodities, some of which are amongst the country's staple foodstuffs. They include items like maize, rice and beans. Since the institution of the Control of Goods Act, the list of licensable Items has been reviewed only very occasionally. The latest review was made in 1988 when items like scrap metals and cement were removed from the list of licensable exports. The list of exports subject to licensing under the above quoted Act and the regulations made under it, is reproduced in the Memorandum for the information of Importers and Exporters. A copy of the latter Memorandum is attached hereto. We are living in an imperfect world. Mostly by acts of governments, perfect competition is not allowed to flourish in the world economy. Controls on imports and exports in Malawi were imposed for reasons that the world markets could hardly do certain things which the country would like. But, in a country where aggregate imports have usually been more than aggregate exports, it does not appear obvious that there could be any reason for licensing exports or for controlling export operations. For the traditional exports which fall within the group of foodstuffs, the most important reason for licensing Is the consideration to ensure food security The striving for self-sufficiency in food supplies requires not only the promotion and expansion of production but also the maintenance of certain levels of supplies. With regard to the estimates as to what are adequate quantities of the different varieties of produce required by the domestic market, ADMARC plays the central role of advising Government on this. It is for this reason that, on considering applications for permits to export the produce, the Ministry consults with that Corporation. The common practice that has evolved is that, prior to the Ministry's consideration of the requests for permits, the requests and application forms are referred to ADMARC for the latter's advice. If ADMARC supports the applications, it endorses the forms with a 'no objection' advice. A few of the local industries use some of the local produce and items as raw materials. Examples of this are, the dhall industry (using various types of pulses), cooking oil industry (using groundnuts, sun-flower and cotton seeds), and the Malawi Iron and Steel Corporation (MISCOR) (using scrap metals) - although, as pointed out earlier on, the licensing of scrap metal exports was decontrolled. Licensing provides Government with an instrument for monitoring exports. While Government would like to promote exports and hence would like to see no hindrances to export trade, occasionally need arises for controlling and influencing the direction both of imports and exports. The controlling and direction of import and export trade is done for political considerations (c.f. trade with Communist countries), for reasons of tactics and trade policy as they might affect the bargaining position of the country in its negotiations with neighbours and other trading partners. A number of goods which are of strategic importance and on which the country spends a lot of foreign exchange could easily be re-exported by some businessmen, leaving the country with shortages of supply of the goods. Such goods include petroleum fuels and fertilizers. There is, of course, the argument that re-exports could bring in a net inflow of foreign exchange. However, such an advantage on products like petroleum products hardly outweighs the disadvantages of disruption of supply to local users, including productive establishments. This applies to metals and atomic energy materials of Strategic value and used in the production of arms, ammunition and implements of war. The instrument of export licensing in this connection is really for checking the potential rather than for controlling what is obtained in the current situation. The mineral products, metals and energy materials which are listed in the Control of Goods Act as licensable include items like uranium, beryllium, lithium and cobalt. For some products, export licensing, to a considerable extent, also assists in checking the wanton depletion of the base resources. The export items involved here include wild animals, wild animal trophies, and crocodile skins. Operations globally can be evaluated and improved by a global marketing audit. Audits have a wide focus, are independently carried out, are systematic and conducted periodically. To be successful audits have to have objectives, data, sources of data and a time span and reporting format. Audits can cover the environment, strategy, organisation, system, productivity and functions. Unfortunately, as in any attempt to gather global data, all the pitfalls of politics, culture, and language differences arise. Much of the preceding discussion covers more sophisticated forms of international control, except budgeting which is applicable to all types of exporting or global marketing. As stated earlier, many less developed countries have export controls imposed by governments. The Malawi case which follows gives an example of this. See appendix 13A for a detailed export control document with reference to Malawi. In every marketing plan there must be provision for organising, implementing and controlling marketing organisations. This is particularly important when marketing globally, due to the many possible pitfalls which can occur, described in the preceding chapters. Depending on the size of the export or global operations a decision has to be made on the type of organisation, whether it be area, product, function or matrix based; on what type of marketing plan, be it standardised or decentralised and on what method of control to install. Formal methods of control include budgets and informal methods include elements of auditing but this depends to a great extent on environmental differences, distance of the market to the seller, the product and other characteristics, not least of which is the size of the international organisation. 1. What are the advantages and disadvantages of area, product, function and matrix based organisational structures in global marketing? Give examples. 2. Describe the factors which have to be considered when deciding on the form of marketing control in international operations. 3. By reference to any source of your choice, identify and describe the different possible forms of marketing control applicable to global operations. Used by highly marketing oriented organisations with stable products. Here product groups have global marketing responsibility. Here executives on functional areas have global responsibility. a) Domestic practices and values of standardisation - these may not be appropriate. c) Distance - the greater the distance, the bigger the physical and psychological differences. d) The product - the more technological the product the easier it is to improve uniform standards. e) Environmental difference - the greater the environmental differences the greater the delegation of responsibility and the more limited the control process. f) Environmental stability - the greater the instability in a country the less relevance a standardised measure of performance is valid. g) Subsidiary performance - the more a subsidiary does, or reports, a non variance the less likely is there to be headquarters interference. Xavia, a Sub-Saharan Africa country, enjoys a moderate climate with one rainy season from November to March. Nature has endowed it with a good typography, soils and rivers but it is prone to drought in particularly poor rainy seasons. Typically, it has a commercial farming sector and a small scale farming sector, the latter having farms in the region of 2 hectares in size. Over the years the country has been building up its horticultural industry. In 1980 it produced some 5,000 tonnes, to some 21,500 tonnes of vegetables, fruits and flowers at present (1992/3). Over the same period, exports have grown from virtually zero to some 12,000 tonnes with a value of X$ 80 million. Most of the exports are sourced from the commercial sector, but a number of schemes are being implemented in the small scale sector to increase the involvement of this large sector of the farming community. In other countries, South America is serving the North American continent well, with its close proximity and political advantage. Australia has its own well developed industry, as do the Asian tigers, Malaysia, Thailand and South Korea. Japan is difficult to enter. The Middle East offers a distinct market, especially in fresh fruit and vegetables, but transport is a problem, there being only 10 cargo aircraft flights per week, with connections to major destinations. Produce is mainly sold in the European Union, particularly UK, Holland and Germany, where agents handle most of the business to date. Elsewhere in Africa, Zambia, Tanzania and Uganda are beginning to get their horticultural production organised and geared for a massive export drive to traditional consumption areas, i.e. the EU. This increase in exports would place a huge burden on internal and external transport, especially air freight which would need to double in uplift capacity, and on the road/rail requirement. It would also need huge investment in pack-houses, storage (cool) and credit. Given the information above and the following, devise a comprehensive export strategy for the Xavia horticultural industry for 1994 - 1996. Clearly show Government Policy requirements, the targeted markets, the marketing mix (product, price, promotion, distribution), documentation and sources of finance. · different versions of established products, i.e. a popular product but supplied during the off-season e.g. asparagus, summer fruits (N.B. there is no need to educate the consumer and can increase all sales of the product by being available through the year) i.e. Improved versions of existing varieties, e.g. cherry tomatoes, non-astringent persimmons, apples and bananas etc. · certain tropical fruits such as lychees, mangosteen. · small, very high priced markets for excellent taste and quality, e.g. tree-ripe fruit, baby vegetables, herbs. · luxury items such as floriculture crops. In addition there is the beginnings of a movement for better flavoured product and crops produced by 'self-sustainable' agriculture. The more important aspects are the consumers' and the retailers' increased concern about health and hygiene with implications for pesticides and packhouse facilities. Eastern Europe will have two influences. In some products it will supply the Western European markets with horticultural crops and in particular in processed products. It will also, in the longer term, open out new markets and expand demand, provided that their economies can develop. Eastern European consumers demand the mainstream products i.e. bananas, oranges, kiwi fruit and to a lesser extent, pineapples. In the medium term only East Germans are expected to influence total European demand significantly. Every year the technology of sea-freight improves, making possible cheaper transport for an ever wider range of crops. We are expecting to see a greater proportion of mangoes, pawpaw and even sweetcorn being sea-freighted over the next 5 years. Air freight is often the single most important cost. Southern and Eastern Africa air freight rates are higher than potential competitors in West Africa and the Caribbean. NB "Regional supply" means Xavia, Kenya, Tanzania, Zambia and Malawi and Zimbabwe. The projections below have been based on our knowledge of the total European market; the future growth potential of each product is likely to have competition from other suppliers. Fine Beans:. The total EU import market has remained static at about 32,000 tonnes but Kenya has succeeded in increasing its share of the market from about 20% in 1985 to nearly 40% in 1989. Kenya is perceived as the only supplier of extra fine beans. Buyers feel over-reliant on Kenya and are looking for new suppliers. Potential threats to Kenya are Uganda, Tanzania and Nigeria. The market for fine and extra fine beans will grow, particularly in the UK supermarket trade which is currently very strong on legumes. Mange -tout: Continued growth in the market in the UK, France, with potential in Belgium and to a lesser extent Switzerland from its current estimated size in Western Europe of 6,000 tonnes and value of $27 million of which perhaps 1,900 tonnes comes from the region. Keener competition from Nigeria will inhibit the region fully exploiting the growth in this product demand. Baby corn: This is mainly a British product with total sales in Western Europe guessed at less than 1,000 tonnes. The product is expected to transfer slowly onto the continent, probably starting in France. We expect that producers will be reluctant to grow it as it is difficult to see how it can be grown profitably. Chillies, okra and other Asian vegetables: Small specialized trade, mainly to the UK. Although some growth of sales to indigenous populations are at higher prices, the demand from immigrant populations is expected to decline as the newer generations lose commitment to traditional meals. Total market is currently about 9,000 tonnes and worth around $25 million, of which 70% comes from the region. Asparagus: A major opportunity. A very high priced and seasonal product which is increasingly popular (15% growth per year)and with additional sales potential in Eastern Europe. It is a crop quite capable of production being manipulated to harvest all year round (AYR). European imports currently account for about 5,000 tonnes with a value of $30 million. Unit gross wholesale prices are expected to fall from about $6/kg to $5.50/kg. Avocadoes: The major growth phase has now finished. Expect Kenya's market share to fall from about 2000 tonnes or 2%, unless sea freight to France can be successfully carried out. Pineapples: As an air freight product this region cannot compete with West Africa. The major market is for sea freighted product, with growth potential in Southern Europe, i.e. Spain, Italy and Greece and maybe Eastern Europe. Tanzania is developing sea freight to Italy with an aimed 3000 tonnes per annum. Kenya will maintain her exports at 3000 tonnes. Sea freighting pineapples is not a highly profitable export business with narrow margins and the need for economies of scale. The Western European market stands at about 250,000 tonnes and will expand at about 5% per annum. Passion fruit: Small European market of some 1000 tonnes. Some growth in France and Scandinavia -but two problems. Firstly, wrinkled skin when ripe is viewed as unappetising by consumers, and secondly, good shelf life means it could be sea freighted if a volume market develops. Ugandian production can create its own market niche. Mangoes: Mangoes will decline as an air freighted product to Western Europe. The Middle East market, however, offers good potential and an expanding market which Kenya is already accessing. With increased production sales will increase. Paw paw: Growing demand in Europe at 50% p.a., but only for small solo types. Should have good skins and strong coloured flesh. Sea freighted product from the Caribbean will be important. Sales potential in the Middle East, which is currently importing from S.E. Asia. Strawberries: Major market for off-season supplies. Kenya's production continues to expand and new projects expected in Zimbabwe and Uganda, while the major off-season supplier Israel is in decline. Sales already being made in the Middle East. Citrus: Around 9000 tonnes of navel oranges are imported from Zimbabwe into the EU, mainly via Belgium (89%). Oranges are almost a commodity. Although volume sales are increasing (12% p.a.) unit prices have been falling by about 4.5% per annum. Sales in Eastern Europe expected to expand but the commodity will remain very price competitive. Legumes such as runner beans, flat beans, even peas and broad beans for off- season supply. Specialist crops such as salad onions, herbs, baby vegetables. Any off-season production of temperate fruits, i.e. raspberries, blackberries, currants, nectarines, cherries, persimmons (non - astringent types). Specialist tropical fruits such as lychees, mangosteen and apple bananas. These crops could generate a further $10,000,000 p.a. It is difficult to see how crops like courgettes (except baby sizes), aubergines, melons and sweet corn will cover current air freight rates. Roses: A product with excellent potential. Expect to see rose projects in production in Kenya at 20 ha, Zimbabwe 80 ha, Zambia 7 ha and Malawi 3 ha. Imports are increasing by 20% p.a. Sales will increase very significantly but prices will fall to 25 cents a stem with production on around 110 ha. Carnations: A product with good potential. Expect to see diversification to standard carnations and increased exports maintaining 7% p.a. growth. Prices will fall to 12 cents a stem. Chrysanthemums: The relative high weight of chrysanthemums will not make this product especially profitable, and the growth will be less spectacular than the other products. Prices are predicted at 30 cents a stem. Other cut-flower crops: Sales of all other flowers are expanding throughout Europe and expected to continue to increase as consumers become more sophisticated in their flower buying and keen for variety from the main items. Gladioli will be discontinued as their prices cannot cover the air freight. Crops like alstromerias, asters, solidasters, proteas will expand. Field grown flowers like Ammi Majus will move from Zimbabwe to new production sites within the region. Statice will continue to be a major crop in Kenya. Other flower sales may amount to another $60,000,000 p.a. Canned products: sales of canned pineapples will remain at $16 million, with perhaps a further $2 million in other sales. Table 13.7 sets out the total projected exports. This anticipates an increase in the value of exports of 10% per annum for fresh produce and flowers. Total exports could be over $250,000,000. Generally the sales of canned products have been in decline across Europe as consumers turn towards better methods of food preservation. The canned pineapples operations in Kenya are not located for optimum pineapple production and are competing against the dominant producers in South East Asia. Reports are coming in that canned French beans operations have started and look likely to be successful. The dominant product is dried onions but the sale of all dried vegetables is in decline as soup consumption is Western Europe is falling. There is at least one dehydrated vegetable operation in Kenya. Its location is viewed as excellent because of the potential for all the year round supply. Quality is reported to be good. Within international trade, increased sales are found amongst the more minor products such as dried green beans, aubergines, courgettes and chives, and premium prices are paid for good quality, well coloured products like red peppers and green cabbage. Micro-biological standards are becoming more stringent amongst buyers and the German market is particularly fussy about sulphur levels. Home freezers and microwave ovens have resulted in increased sales in frozen vegetable products. It is unknown why no major frozen vegetable factory has been established in the developing world. Climate and infrastructure would be suitable both in Zimbabwe and Kenya. With increased sales of all types of convenience foods, some exporters developed semi-prepared vegetable products, i.e. peeled and diced etc. Some are prepacked for immediate microwave use. Another example is the sale of peeled and sliced pineapple sections treated with a natural bactericide (eg. citric acid and prepacked). Both products are high value and can carry air freight rates. Increased consumption of fruit juices is a world wide trend. Passion fruit plants have been considered in Kenya and in Zimbabwe. Passion fruit prices are notoriously unpredictable. They peak at over $5,000 per tonne and drop to $2,000 per tonne. Very often projects fail because they are budgeted on high prices rather than using a low working average in the initial study. Secondly, international trade in fruit juices is dominated by very few trading companies, which places the grower/processor in a very weak negotiating position. Currently, Malawi is a respected supplier of the extremely hot bird's eye chilli peppers. Unfortunately, the market is relatively small and the product very low priced for an extremely labour intensive crop. The potential exists for growing other varieties of chillies. The demand for paprika oleoresin (the market for the extracted colour component for dried paprika oleoresin has been expanding with the increased demand for natural colorants in developed countries). The world market stands at about 500 tonnes and is worth approximately $30 million. A successful plant has been operating in Ethiopia for the last 20 years. Paprika peppers are an ideal small farmers group. Oleoresin operation could be suitable for Zimbabwe. The world price for vanilla has continued to increase. This crop grows successfully in Uganda. The new rapid curing technology is producing a product of the highest standard and sales are being made to the world's major buyers. The European market for dried flowers is currently worth $70 million a year and is currently expanding at 15% per annum. 25% of the products are imported from outside the EU. Zimbabwe, with her skills in floriculture and the crop drying technology used for tobacco, should be able to develop a portion of this trade for herself. The typical flow patterns for horticultural exports into the EU from the region are set out below. There will be differences between countries and individual growers. The majority of the produce imported will be routed by importers and end up for sale in supermarkets, possibly via a pre-packer. The vast majority of Zimbabwean flowers and over half Kenya's are sold via Dutch importers who put about 90% of their imports through the Auction markets. Most of this material (about 70%) is exported out of Holland to other European markets, but particularly Germany, where it is sold by Wholesalers to Florists. Sulmac, of Kenya, own their own marketing company in Germany (a joint venture with Florimex) which facilitates direct sales into this important market. Germany is the largest market in Europe. The major wholesale markets are Hamburg, Dusseldorf, Berlin and Cologne. The larger importers will import themselves from outside the EU. Agents working on behalf of the non-EU exporter are often used to provide market feed back. After Germany, France is the major import market, and a market expanding at 15% p.a. Specialist importers supply the wholesale trade, which is mainly centred around the Rungis market in Paris. In the UK, sales are increasing by over 20% which reflects the sudden interest of supermarkets in cut flowers. Sales are made to them by major importing companies, many of whom will make up bouquets, using flower mixes sourced from different countries according to price. 1 Islam, N., Horticultural Exports Policy Issues, IFPRI. 1990. 2 Doesburg, J.V., Channels of Flower Distribution, Int. Floriculture, Vol 1, Nos. 4. 1 Helmberger P., Campbell C and Patson W. "Organisation and Performance of Agricultural Markets in A Survey of Agricultural Economies Literature". 2. Cain, W. W. "International Planning: Mission Impossible? "Columbian Journal of World Business". No. 58, July-August 1970. 3. Mkandawire, G. M. "Controlling Export Operations". In Carter S. (ed), "Export Procedures", Network and Centre for Agriculture Marketing Training in Eastern and Southern Africa, FAO, August 1991, pp 129 -132. 8. Philip C, Lowe R. and Doole I. (1994) "International Marketing Strategy; Analysis", Butterworth Heinemann. 10. "International Marketing Review" MCB Publications, UK. 11. Malnight, T. W. "G localisation of an Ethnocentric Firm: An Evolutionary Perspective Strategic Management Journal. Vol 16 No. 2 Feb 1995 pp 119-141. 13. Das M. "Successful and Unsuccessful Exporters from Developing Countries". "Some Preliminary findings". European Journal of Marketing Vol 28 No. 12 1994 pp. 19-33. 16. Terpstra, V.(1987) "International Marketing", 4th ed. Dryden Press.